Mummy Hearts Money: 6 months old! Sebastian is 6 months old already. I can't believe it, It has absolutely flown. When I think what a miserable, scrawny little man he was when he arrived 7 weeks early, and I look at my fat, roly poly little bubba now I feel so lucky. Being a premmie, he has lots of appointments all the time. Cardiologists, ears, eyes, Paediatrician, regular GP checkups, it never ends. For the most part he is smashing through his appointments. He has a little heart murmur that we will need to wait another year now to see if it clears up & a slight failure in his right ear that also may clear up given time. Nothing life threatening. To celebrate turning 6 months old we had our first bowl of Farex! 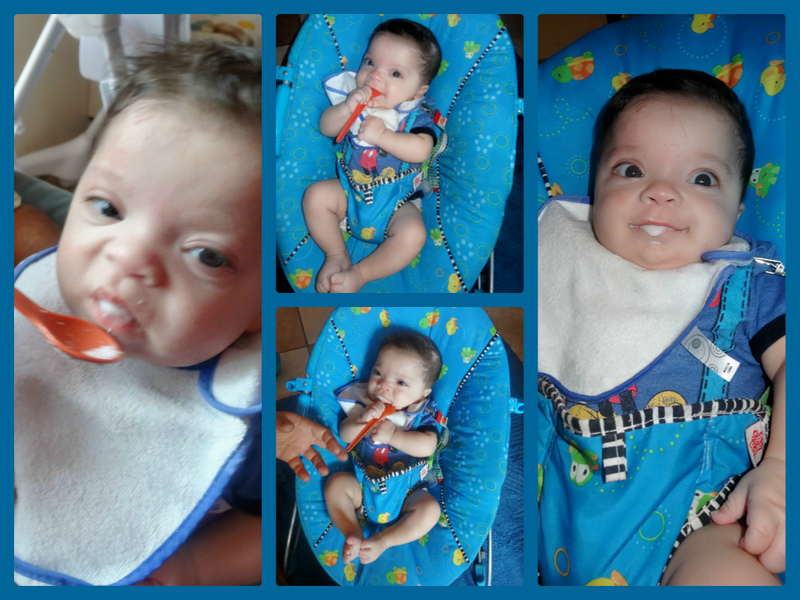 He was so cute, definitely the most enthusiastic of my 3 kids about his first solids. He licked away at the spoon, looking for more almost straight away. He ate more in his first sittings than either of his sisters did, so it looks like he will be a boy to like his tucker! Lolly was interested in the process, so I gave her a mouthful too, and just managed to snap a photo of her reaction. 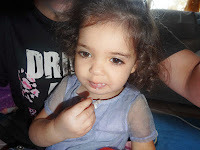 The whole mouthful came out pretty quick, apparently Farex doesn't taste as good as it looks when her little brother is eating it! Seb seems to develop roughly at the pace of a child 7-8 weeks younger than him. Whenever he hits a milestone, I write it up in his baby book, and sneak a peek at his sisters. It's almost always 6-8 weeks behind them. This seems pretty reasonable to me, that he would need the extra time but the clinic nurse was kind of implying this week that he should have caught up to other babies his own age by now. I'm not sure how I feel about that, it goes against my instincts. We have Sebs 6 month appointment with his GP next week so I will chat to him about it. I don't want to start stressing over delayed development if it isn't necessary but I also don't want to ignore it if early intervention can help. In the meantime he is a happy, placid baby who adores his big sisters. I think he looks more and more like his Daddy every day which is what I was not so secretly hoping for. For those of you that were wondering, the current medical recommendation is to start babies on solid food when they turn 6 months old. We had already checked with his GP and the clinic nurse on whether we should wait till he was 6 months adjusted age, or 6 months actual age, and both recommended starting at 6 months actual age. Since it may differ from baby to baby, if you find yourself in the same situation I suggest checking with your doctor before starting solids if you have a premmie and you aren't sure.